Beta Fuel has been developed to maximise carbohydrate absorption while minimising the risk of gastrointestinal distress. Fuelling long endurance events (greater than 2.5 hours) requires 60-90 g of carbohydrate per hour. Beta Fuel has been developed to deliver these high levels of carbohydrate with minimal risk of GI issues. 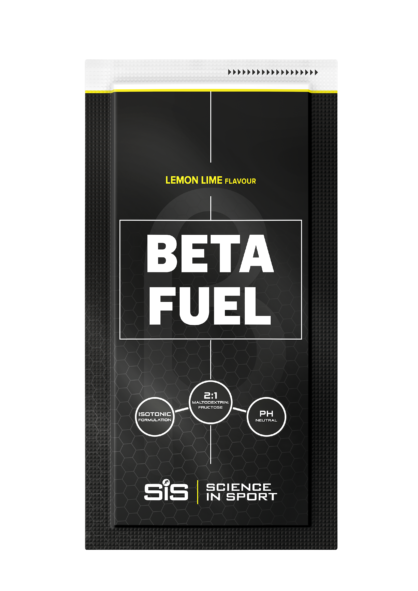 Beta Fuel has been developed to deliver the maximum amount of carbohydrate in a 2:1 ratio of Maltodextrin to Fructose whilst limiting gastrointestinal distress. The product mixed to concentration is 80 grams carbohydrate (2:1 maltodextrin:fructose), 20 mmol/L sodium and 500 ml of fluid per serving. A breakthrough in endurance nutrition, the pH-neutral isotonic solution was first time publicly used to fuel Chris Froome and Team Sky to victory at the 2018 Giro d’Italia. MAXIMUM ISOTONIC ENERGY – Added fructose enables the body to absorb 90g carbohydrate per hour, 50% more than the 60g per hour achievable with glucose alone. MINIMAL GI DISTRESS – Unique isotonic formula means that high levels of carbohydrate can be absorbed with minimal risk of gastrointestinal issues. NATURALLY FLAVOURED – Developed with no artificial flavours. Available in Orange or Lemon Lime. Suitable for vegan, coeliac, lactose-free, gluten-free, wheat-free and nut-free diets. NO COMPLICATIONS – Ideal for endurance exercise lasting over 2.5 hours and where refuelling is difficult. Simply mix & go. A rate limiting factor of exogenous carbohydrate utilization during exercise is the transportation of the nutrients across the intestinal wall. Once the sodium-dependent transporter, used to transport maltodextrin, is saturated at 60 g.h additional carbohydrate can be absorbed through another transporter, GLUT5, used to transport fructose. Fuelling requirements for long endurance events (greater than 2.5 hours) are 60-90 g of carbohydrate per hour. The ability to deliver such high levels of carbohydrate with minimized risk of GI issues is crucial to performance. Beta Fuel can be used to meet these fuelling demands in an isotonic solution. During long endurance events greater than 2.5 hours, it is recommended to fuel with 60-90 grams of carbohydrate per hour, from the first hour. When fuelling a flat, less technical ride, drink 250 ml of Beta Fuel per hour and use additional products from the GO Energy Range to fuel with 60-90 grams of carbohydrate per hour. When the route profile is challenging, i.e long climbs or technical descents, drink 125 ml of Beta Fuel every 15 minutes to fuel an hour. Informed Sport Registered: SiS product range is developed using a world-class approach to banned substance testing, providing assurance for athletes. Why is it called Beta Fuel? In development, a beta test is the second phase of testing in which a sampling of the intended audience tests a product or service. Beta Fuel has been in elite testing since summer 2017 and we will continue to gather elite insight and complete performance trials throughout 2018. How does Beta Fuel work? A rate limiting factor of exogenous carbohydrate utilisation during exercise is the transportation of the nutrients across the intestinal wall. Once the sodium-dependent transporter, used to transport maltodextrin, is saturated at 60g per hour, additional carbohydrate in the form of fructose can be absorbed through another transporter, GLUT5.